Think you can use a spray foam insulation gun for slab lifting? Well think again. If you've tried it, you know insulation guns become an expensive proposition with the constant need for replacement parts. They're also tedious to use, which can slow down production. And they often leak foam at the port when used for slab lifting. This is why we designed a gun specifically for the slab lifting industry. 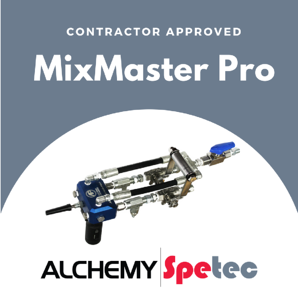 The MixMaster Pro slab lifting gun is built to last. It easily handles back pressure and has a leak proof port connection. It boasts an efficient design with minimal replacement parts. With an average cleaning time of 10 minutes, this gun is designed for ease of use. Spend less time repairing and cleaning your gun, and more time pumping foam! Want more information on this reliable slab lifting gun?